Beautiful villa in top class condition with a southerly panoramic view over the bay of Villefranche and 1 mile from Cap Ferrat. Completely renovated to the absolute highest standard. Easy walk to the port (4 minutes) without having to cross roads etc. Very central, yet quiet. Perfect for entertaining. Full concierge service can be made available. Grand Villa Soleia is a Mediterranean paradise. Offering panoramic views, multiple terraces overlooking the sea, a gorgeous swimming pool and 6 bedrooms sleeping 12 people - this is the perfect villa for large families or groups. Known as one of the best and most beautiful villas on the Côte d'Azur, it was built in 1880 and has all of the beautiful Belle Époque features of that period, whilst remaining satisfyingly modern, and located only 100 metres from the beach. Upon entering the property, you will be taken aback by the interior decor. It has been beautifully and modernly renovated, all whilst holding onto its original character. There are 12 bedrooms, most with stunning views and beautiful decor. The bathrooms will leave you dreaming and the communal areas are spacious and pleasant. There are guest quarters at the side and a guardian's house at the other side. This villa is perfect for entertaining as it can cater for up to 50 guests. The views over the bay are astonishing and it gets sun all day. The outside area of this property is absolutely stunning, complete with a quaint yet spacious garden, covered in a blanket of bright green lawn. There are many terraces offering the perfect place for al fresco dining, all whilst looking out onto the panoramic view of the sea and the surrounding hills. The swimming pool invites you into its crystal clear water, and offers a stunning view of the Mediterranean that will leave you breathless. This swimming pool is heated, so can also be used during the colder seasons. The swimming pool area is equipped with sun-beds, helping you get that long awaited sun-tan. One of the best features of this property is its stone-walled outdoor dining area, complete with a BBQ area. There is a child's swing, sand pit, garage space and wonderful garden and terraces. Air-conditioning, central heating, daily maid service, fax, linen provided, safe, staff, telephone, towels provided. Bedrooms: 6 bedrooms (2 King Size, 2 Queen size, 2 twin), sleeps a maximum of 12 people. Garage: Garage with space for 1 car and electronic gates. Living room: Fireplace, living area seating for 10. Dining room: Seating for 10. Suitability: Children welcome, low allergen environment, pets not allowed, unsuitable for elderly or infirm, wheelchair inaccessible. Services: We can also supply chefs, drivers, nannies, personal manager etc. Villefranche is situated between Monaco (Monte Carlo) and Nice. This is considered the best part of the Cote d'Azur and is regarded as one of the world's great locations. 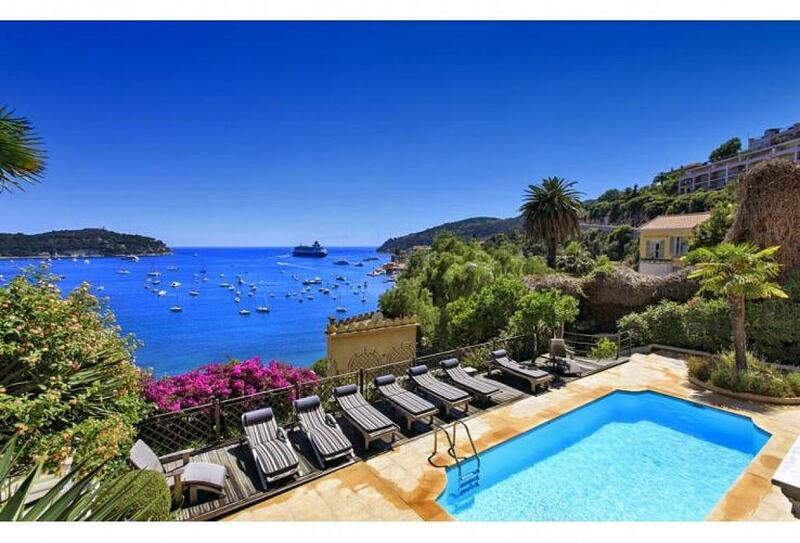 The villa is also a 3 minute drive to Cap Ferrat or Beaulieu-sur-Mer. The station is a 1 minute walk from the villa and the train travels all along the coast to Italy or back to San Tropez. RESTAURANTS / SHOPS – Walk to th port along road opposite gate. No need to go to beach or station. There is a small bakery, supermarket etc. there.Taxis can be got in port. Nice international airport is 8 Miles away. The beach is 100m away. Old Port of Villefranche has many good restaurants. CAP FERRAT is on the other side of the bay and has some wonderful beaches such as Fossa beach behind the village. However, parking can be an issue in Summer. TRANSPORT : The train is excellent. Timetables available. Buses on main street. NICE is a 5 minute ride to ‘Nice-Ville’ and Monaco about 15 minutes. Casino supermarket, bakery, newsagent in Rue du Poilu which is street behind waterfront. Also shops up on Basse Corniche , below Villa Seriamis. WALKS : Walk to Beaulieu but take a right turn at Royal Riviera Hotel to get to village of Cap Ferrat along water’s edge. Walk around Citadel edge to the D’Arse. Monthly bookings: 20% discount Sept to May. 10% discount June to August. Special rates apply for Monaco Grand Prix week. Each bedroom in the main house is equal with the same views and has a walk in dressing area with en-suite bathroom. One of the bedrooms has an office area. All appliances are new. Guardian house : Self contained. Double bed with en suite bathroom off it.